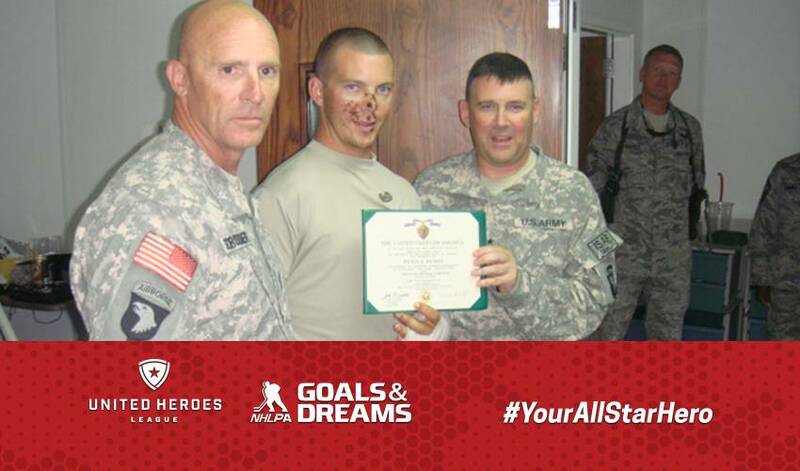 This is the last of a four-part series highlighting the NHLPA and UHL 2018-19 All-Star Hero campaign, which through the NHLPA Goals & Dreams fund, recognizes military personnel and their families for their services. Today’s story spotlights Sergeant Michael Brewer of the United States Army. The tradition of sport bonding parents and their children creates a timeless bond. So what more of a memorable experience is there for a father and son than seeing the greatest athletes in your favourite sport take to the same ice for a whole weekend? It was that exact news for an unsuspecting Sergeant Michael Brewer, recipient of a Purple Heart as well as an Army Commendation with Valor, that NHLPA player ambassador and forward for the New York Rangers, Vinni Lettieri, was thrilled to be a part of relaying. One of the four service members selected as part of the All-Star Hero campaign, Sgt. Brewer will take in all the action, on and off the ice, at the 2019 All-Star Weekend in San Jose. Brewer will have his son, Alex, alongside for the once-in-a-lifetime trip to California after being nominated by Jill, who calls her husband and son the two heroes of the family. Lettieri recalled his own All-Star experience as a youngster. "I wish you guys the best. I hope you have an absolute blast on this All-Star trip. I remember I went as a kid with my father. I'll never forget it, it was an experience like no other." “My husband Mike entered the military when he was 29. He had been to Iraq as a civilian and had seen friends of his get killed. He decided to join the fight. He deployed for 15 months to Iraq and then deployed to Afghanistan. Three months into his deployment to Afghanistan, he was out on a convoy. He was the lead driver of the convoy when they were ambushed. His truck was hit by 2 RPGs [Rocket-Propelled Grenade) and an IED (Improvised Explosive Device). One RPG came in his driver's side window, six inches from his face, and went off. He couldn't see anything due to the smoke and blood from his wounds. But even though he was severely injured, he continued to drive. He got his convoy to a safe place before stopping to assess his wounds. This resulted in there not being anyone else injured besides him and his convoy commander who was in the truck beside him. “The second hero in our family is my 10-year-old son, Alex. Unfortunately, due to recurring symptoms that Alex has been experiencing recently, he has not been able to take to the ice to join his teammates with six more months of antibiotics ahead of him. Described by his mother as a “strong little boy who watches the movie ‘Miracle’ over and over”, who also says Lyme Disease is just a minor setback for him, Alex and his father will get to enjoy a weekend free of doctor appointments and instead basking in all things hockey. Sgt. Brewer has endured 14 surgeries to his hands and face to repair severe shrapnel damage since his return and awaits further surgeries after battling a Traumatic Brain Injury and Post-Traumatic Stress Disorder. Despite his return home, Sgt. Brewer continued to be affected by combat overseas by the loss of a friend and fellow solider. Hudella, president and founder of the UHL, was touched by the stories that he read throughout the campaign that launched in December 2018. You can follow Sgt. Brewer's story and 2019 NHL All-Star experience on social media by following @NHLPA on Twitter or Instagram, and tracking #YourAllStarHero.